Wuest: Therefore, as for you, you shall be those who are complete in your character, even as your Father in heaven is complete in His being. Young's Literal: ye shall therefore be perfect, as your Father who is in the heavens is perfect. Therefore - (term of conclusion) Based on what He has just said about the need to demonstrate in one's life those things He has just described such as going the extra mile (now we know where this common saying comes from! ), loving enemies and even praying for them, etc. C H Spurgeon exhorts all blood bought, heaven bound sons of God to "Stretch towards the highest conceivable standard, and be not satisfied till you reach it." You are to be - This phrase is interpreted by many in the sense of a future command. Jesus clearly intends it as an exhortation in light of all He has already said. We are called to be lights in this present darkness and the best light shines like the Father and gives glory to Him. Others see in this statement a promise -- "you shall therefore be perfect" (Young's Literal). The pronoun you is emphatic and clearly charges those who would be His followers to be perfect. We will be “perfect, even as [our] Father which is in heaven is perfect” (Matthew 5:48). How good does a man have to be to please God? God is not satisfied with anything less than absolute perfection. How good does a man have to be to stand in the presence of God? He has to be as good as God is. If one falls the slightest degree short of the standard of God’s inviolable, unalterable holiness, he is unacceptable to God. What is God’s standard? God does not hate; therefore, if a man is as perfect as God is, he will not hate (Mt 5:21-26). God does not lust; if a man is as perfect as God is, he will not lust (Mt 5:27-32). God does not deceive; if a man is as perfect as God is, he will not deceive (Mt 5:33-37). God does not retaliate for injury done; if a man is as perfect as God is, he will not retaliate. He will not stand on his own rights (Mt 5:39-42). Perfect (5046) (teleios from télos = goal, purpose) means one who has attained to the end (aim) or to the intended goal (telos). If anything has fully attained that for which it is designed it is perfect (teleios). Teleios was used to refer to the maturity of an adult, which is the end or aim to which the child points. Thus it denotes those who have attained the full development of innate powers, in contrast to those who are still in the undeveloped state (children). Teleios signifies consummate soundness, and includes the idea of being whole. Teleios (perfect) is often translated “mature”, but in the context the meaning is that of perfection, because the heavenly Father is the standard. We must measure ourselves not by others but by the Father. To be perfect is essentially the sum of all that Jesus teaches us in the Sermon on the Mount and ultimately is the sum of all that is taught in Scripture. The “sons” are to be perfect, as their heavenly Father is perfect. That perfection is absolute perfection and includes our words (Matthew 5:33-35, 5:36-37), our responses to injuries (Matthew 5:38-39, 5:40-42), and our dealings with our enemies (Matthew 5:43-45, 5:46-48). The great purpose of salvation, the goal of the gospel, and the great desire of the Father is that men would be conformed to the image of His Son, the only One Who ever lived a perfect life. If a man could live the way Jesus has told us to in this chapter, he would truly be perfect. Perfection is our continual goal in this life, but in the life to come will be our everlasting possession and experience. A T Robertson explains that perfect "comes from telos, end, goal, limit. Here it is the goal set before us, the absolute standard of our Heavenly Father. The word is used also for relative perfection as of adults compared with children." Such pursuit of perfection in this present earthly life is clearly impossible in one’s own power. To those who wonder how Jesus can demand (command) the impossible, He later says, "With men this is impossible, but with God all things are possible." (Mt 19:26, Mk 10:27) (IM-possible but HIM-possible!) Holy-ness requires a Holy-Source, the Holy Spirit. THOUGHT - Are you learning to "walk by the Spirit" that you might not carry out those every present desires of your fallen, sinful flesh (Gal 5:16+)? You can't. He never said you could. But He can and He always said He would. For believers, it is Christ in us the hope of Glory (Col 1:27-note) Who empowers us by His indwelling Spirit (Gal 5:16, 17, 18, 24-see notes Gal 5:16; 17; 18; 24; cp Ro 8:13-note) to live the way the Father commands. Christ is now our life (Col 3:4-note). As one person has noted, if you remove the "a" from "Christian" and place it at the front what you see is "A Christ In"! 14 I press on (dioko = a verb which gives the picture of pursuing with earnestness and diligence in order to obtain a goal. The present tense = this was Paul's habitual practice, the warp and woof of his life) toward the goal for the prize of the upward call of God in Christ Jesus. Harry Ironside writes that "This is perfection in the sense of the complete absence of partiality, thus imitating Him who is no respecter of persons (Acts 10:34), but who lavishes His favors on just and unjust alike. God's choicest blessings are for those who demonstrate the same spirit of reverence for Him and meekness and compassion for others, which were seen in all their fullness in our blessed Lord as He walked this earth in the days of His flesh (He 5:7-note). That spirit, which is beyond the reach of the natural man, is fulfilled in those who have received a new life and nature through trusting in Christ as their Savior. No adverse circumstances can disturb the serenity of those who know the Lord and who acknowledge His authority over their lives. "The key thing to understand is that while a Christian can be, for a time, carnal, a true Christian will not remain carnal for a lifetime. Some have abused the idea of a “carnal Christian” by saying that it is possible for people to come to faith in Christ and then proceed to live the rest of their lives in a completely carnal manner, with no evidence of being born again or a new creation (2 Corinthians 5:17). Such a concept is completely unbiblical. James 2 makes it abundantly clear that genuine faith will always result in good works. Ephesians 2:8-10 declares that while we are saved by grace alone through faith alone, that salvation will result in works. Can a Christian, in a time of failure and/or rebellion, appear to be carnal? Yes. Will a true Christian remain carnal? No." (Ed comment: The reason this topic is so significant is that influential writes such as Lewis S Chafer divided Christians into two groups - carnal and spiritual in his work "Holy Spirit, vi; cf. p 190.). Stretch towards the highest conceivable standard, and be not satisfied till you reach it. We should reach after completeness in love,- fullness of love to all around us. Love is the bond of perfectness; and if we have perfect love, it will form in us a perfect character. Here is that which we aim at,-perfection like that of God; here is the manner of obtaining it,-namely, by abounding in love; and this suggests the question of how far we have proceeded in this heavenly direction, and also the reason why we should persevere in it even to the end, because as children we ought to resemble our Father. Scriptural perfection is attainable, it lies rather in proportion than in degree. A man’s character may be perfect and entire, wanting nothing; and yet such a man will be the very first to admit that the grace which is in him is at best in its infancy, and though perfect as a child in all its parts, it has not yet attained to the perfection of full-grown manhood. What a mark is set before us by our Perfect King, who, speaking from his mountain-throne, saith, “Be ye perfect, even as your Father which is in heaven is perfect”! Though you cannot be perfect, yet you must want to be perfect, and there must not be any sin which you knowingly spare. Cut them in pieces, every one of them; as soon as you know that anything is wrong, I pray you to have such a tender conscience that you will seek to escape from it; for, as long as you harbor even one of them, comfort will never come to you. William Barclay summarizes this section - Here we have the key to one of the most difficult sentences in the New Testament, the sentence with which this passage finishes. Jesus said: "You, therefore, must be perfect as your heavenly Father is perfect." On the face of it that sounds like a commandment which cannot possibly have anything to do with us. There is none of us who would even faintly connect ourselves with perfection. The Greek word for perfect is teleios (Greek #5046). This word is often used in Greek in a very special way. It has nothing to do with what we might call abstract, philosophical, metaphysical perfection. A victim which is fit for a sacrifice to God, that is a victim which is without blemish, is teleios (Greek #5046). A man who has reached his full-grown stature is teleios (Greek #5046) in contradistinction to a half-grown lad. A student who has reached a mature knowledge of his subject is teleios (Greek #5046) as opposed to a learner who is just beginning, and who as yet has no grasp of things. To put it in another way, the Greek idea of perfection is functional. A thing is perfect if it fully realizes the purpose for which it was planned, and designed, and made. In point of fact, that meaning is involved in the derivation of the word. Teleios (Greek #5046) is the adjective formed from the noun telos (Greek #5056). Telos (Greek #5056) means an end, a purpose, an aim, a goal. A thing isteleios (Greek #5046), if it realizes the purpose for which it was planned; a man is perfect if he realizes the purpose for which he was created and sent into the world. Let us take a very simple analogy. Suppose in my house there is a screw loose, and I want to tighten and adjust this screw. I go out to the ironmonger and I buy a screw-driver. I find that the screw-driver exactly fits the grip of my hand; it is neither too large nor too small, too rough nor too smooth. I lay the screw-driver on the slot of the screw, and I find that it exactly fits. I then turn the screw and the screw is fixed. In the Greek sense, and especially in the New Testament sense, that screw-driver is teleios (Greek #5046), because it exactly fulfilled the purpose for which I desired and bought it. So, then, a man will be teleios (Greek #5046) if he fulfils the purpose for which he was created. For what purpose was man created? The Bible leaves us in no doubt as to that. In the old creation story we find God saying, "Let us make man in our image after our likeness" (Genesis 1:26). Man was created to be like God The characteristic of God is this universal benevolence, this unconquerable goodwill, this constant seeking of the highest good of every man. The great characteristic of God is love to saint and to sinner alike. No matter what men do to him, God seeks nothing but their highest good. Thy heart could only love." What is the measure of attainment that is really possible for Christ’s disciples upon earth? Ought they not to expect to live perfect lives? But the text gives no warrant for such an assertion. No doubt it says that attainment to maturity—to perfection according to creaturely limits—is eventually possible. But when this attainment can be made is not stated (Ed note: When we are glorified our perfection will be perfected!). Many will, indeed, affirm that, as our Lord is giving directions to His disciples concerning things in this life, the attainment also is affirmed to be possible in this life. But this by no means follows. Christ gives the command, and by the form of it implies that it shall be carried out to the full. But this is quite consistent with the conception of a gradually increasing development of love which, in fact will attain maturity, a state in which God’s love has ever been; but not immediately and not before the final completion of all Christ’s work in us (Ed note: I am not sure what the author means in this statement - he seems to be alluding to the ultimate perfection when saints are glorified.). A. “But I say unto you, Love your enemies,” -- The Old Testament implied that believers are to love all men but the Lord Jesus makes it even more specific by saying the Christians are to love their enemies. To love a person, who injures you, is humanly impossible. Only God can place this kind of love in the human heart. ILLUSTRATION: Saint Augustine said good for good is natural; evil for good is devilish; but good for evil is divine. B. “Bless them that curse you, do good to them that hate you, and pray for them which despitefully use you, and persecute you.” -- Our Lord teaches that Christians are to counteract evil by doing good. When a person does us a wrong, we are to do him a good. When he curses us we are to wish only good on him. When he persecutes us, we are to pray for God’s blessing on him. C. “That ye may be the children of your Father which is in heaven:” -- One does not become a child of God by loving his enemies. 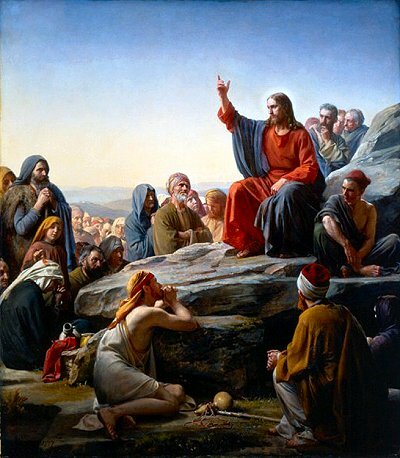 Besides, the context tells us that He is talking to His disciples who are already Christians. By loving their enemies Christ’s disciples show and display the fact they are godlike. Love is a definite test of our discipleship (John 13: 34, 35). D. “For he maketh his sun to rise on the evil and on the good, and sendeth rain on the just and on the unjust.” -- God is good to the saved and unsaved alike in his natural blessings and so should the Christian be good to all men indiscriminately. POINT: Regardless of race, color or culture, Christians are to love all men because God is love, and Christian’s are to reflect to all men the God of love. E. “For if ye love them which love you, what reward have ye? Do not even the publicans the same?” -- Love responds to love and any one can have that kind of love, but there is no real reward in loving that way. Real love learns to love the unlovely. F. “And if ye salute your brethren only, what do ye more than others? Do not even the publicans so?” -- Love is to go beyond our Christian brethren to all men. But it is to be extended even further to those who are our enemies. When we can love our enemies, we are beginning to enter in to Christlike love. When we do, there is no need to be revengeful. “More than others” -- There is a higher standard for the followers of Christ. G. “Be ye therefore perfect, even as your Father which is in heaven is perfect.” -- This has been a very perplexing problem for many because they have not known the Greek. How can any Christian be perfect as God in heaven is perfect? The words “be ye perfect” are a quotation for the Old Testament, from Deuteronomy 18:13. The Hebrew word translated perfect means whole or complete. The Greek word here means complete or mature. God is totally complete and supremely mature in His love towards all. In the same way, Christians are to have a complete and mature love towards all. POINT: It is not an incomplete and imperfect l love (that is, just for friends) but a complete and mature love (embrace even our enemies). B. Teleios = Totality, whole, w/o blemish. Fully developed. Mature in mental & moral character. Full development, growth into maturity of godliness. 1. We spiritually don’t grow all at once, as we don’t physically. a) 1st we’re a baby, then child, then young adult, then adults. Be adults. Be grown up. Be Mature in these areas discussed. C. It’s moving from ignorance (baby stage), to self centeredness (child stage), to God & other centeredness (young adult). to intentionality & strategy (parent stage). D. Maturity to me is when a person moves from church & their christianity being all about them. Them enjoying the service, appreciating the worship song selection, getting ministered to, being fed, them getting. Maturity moves to them giving. 1. Them identifying their gifts to be used for the edifying of others. Them doing their all to make sure others are getting something out of the service (eg. nursery helper, so parents can here message w/o distraction). Them giving of their time, talent, & treasures. Them connecting to God & others & not waiting for someone to connect them. Them self-feeding & not waiting to get fed. Them moving from just doing to being. 2. Them deciding their yes means yes & no means no. Them turning cheeks, them suffering themselves to be defrauded, them going the 2nd mile, them giving or loaning to those in need. Them loving enemies & not just friends. Them blessing, doing good, & praying for not so nice people. Them showing love & greeting even evil men/women. Maturity’s mark is emblazoned upon one who is growing & not remaining stagnant in their faith life. 3. It is moving from being needy, from seeing all what I can get, to noticing that there are others whom I can serve. 4. The final and real act of maturity is when one comes alongside to disciple someone, helping them to learn how to form there life around Jesus. Explore the Bible - A Christian growing in godly perfection will demonstrate a love even for their enemies. Let me ask you to really think. What does the Lord hate? Does the Bible ever say He hates His enemy Satan? We know Christ while on the cross asked for forgiveness for those crucifying Him. Did He know Satan was behind the crucifixion? Of course He did and he still forgave. We are very much like Christ when we forgive, and it moves us more toward godly perfection. Christians must be different than the worldly person. Their expressions of love may be very meaningful, but the Christian must demonstrate love in areas above and beyond those of the lost person. We must allow Christ love to direct us to love everyone, and this is just part of Striving For Godly Perfection. Amen? Amen! Gil Rugh - What a high standard! God does not call us to do anything that He does not enable us to do (ED COMMENT: AND HE HAS PROVIDED US WITH THE "ENABLER" WHO INDWELLS US AND GIVES US THE DESIRE AND POWER TO DO SUPERNATURALLY WHAT IS OTHERWISE LITERALLY IMPOSSIBLE NATURALLY. CHRISTIANS ARE TO BE WALKING "MIRACLES" MANIFESTING SUPERNATURAL LOVE WHO GIVE A PROPER PICTURE OF THEIR FATHER IN HEAVEN - Mt 5:16+ - SEE EXAMPLE OF AMISH BELOW). "Therefore you are to be perfect, as your heavenly Father is perfect." (Matt. 5:48). What a standard! We cannot expect to meet it fully in this life, but God forbid that we should cease to strive for it. In Philippians 3:14, Paul talked about pressing on "toward the goal for the prize of the upward call of God in Christ Jesus." That needs to be our goal. Reformation Study Bible - The standard that God demands of His people is His own perfect character. God’s perfection includes the love of benevolent grace (Mt 5:45). Although perfection is not attainable in this life, it is the goal of those who have become children of the Father (Phil. 3:12, 13). (1) The statement of Mt 5:43. Only the first part is found in the OT (Lev 19:18); the second part was inferred from that. (2) The moral distinction. To understand Jesus' teaching here, we must acknowledge that there is real evil, and that we have enemies (they are not really friends who only appear to be foes) bent upon persecuting us (Mt 5:11). (3) Radical love. The citizens of the kingdom must follow the model of their heavenly Father who by his common grace blesses the evil and the good, the righteous and the unrighteous (Mt 5:45). This kind of love, like his, must be perfect (Mt 5:48, teleioi). In this context, teleioi means not "mature" (God's love does not mature), nor "perfect" (disciples will never be perfect, either in this age or in the age to come), but "all-inclusive." Our love, like God's, must know no bounds (see NEB). It is to extend, not just to those who love us (Mt 5:46) nor just to fellow-Christians (Mt 5:47), but to enemies and non-believers as well. For support of this interpretation of teleioi, cf. Lk 6:36+. Christian love extends beyond the bounds of the Christian community. For Jewish-Christians, the practical lesson was to love the Gentiles as God and Christ did (Mt 28:18-20), and also fellow-Jews who persecute them for becoming Christians (Mt 10:17). Phil Newton - The culmination of all that he has said about the kind of character involved in loving our enemies and praying for our persecutors is found in verse 48: "Therefore you are to be perfect, as your heavenly Father is perfect." The "therefore" brings it to a conclusion. Some think that this verse wraps up all of the instructions that Christ gives concerning the law, and that is surely true. But in a special way it focuses upon this command to love, for the command itself is the most difficult of all - and the most God-like of all that Christ has set forth for kingdom citizens. Language scholars point out that the grammar suggests both "you will be perfect" and "you must be perfect" as the intention of Christ. It is both a command and a promise [L. Morris, The Gospel of Matthew, 133]. As a promise we have great confidence that the Lord will perfect us on that day that we stand complete before Him (I John 3:1-3). But how do we deal with the command? Some have taken this to imply that we can reach moral perfection in this life, but the preceding Beatitudes mitigate against this as does a host of Scriptures (e.g. I John). All the commands ultimately point to the perfections of God. He is perfect in a final sense in that nothing can be added to the depths of his perfections. But we are to pursue perfection in a progressive sense. We look to Christ as our standard. We see that the Lord has "raised the bar" of the Christian's behavior to be nothing short of reflecting the life of Jesus Christ. Everything that we do should have that homing device built within that we are pursuing the perfection that Christ promises when we stand before His throne. This means that all of life is a pursuit - a faithful, persistent, never-giving-up, growth in grace pursuit of the perfection that belongs to our Lord. Leon Morris sums it up: "Jesus is calling on his followers to be mature people, attaining the end for which God has made them. God has set before us the highest standards; it is expected that we will press on to attain them" . And He has provided the grace and promises for his people to do just that. John Piper asks - Where Does Power to Love Like This Come From? Now how can we do this? Where does power to love like this come from? Just think how astonishing this is when it appears in the real world! Could anything show the truth and power and reality of Christ more than this? Let me just give you part of the answer from Matthew 5:11–12, "Blessed are you when men cast insults at you, and persecute you, and say all kinds of evil against you falsely, on account of Me. 12 Rejoice, and be glad, for your reward in heaven is great, for so they persecuted the prophets who were before you." Jesus says that not only can you endure the mistreatment of the enemy, but you can also rejoice in it. Why? Because your reward in heaven is great. Which means that the command to love your enemy is a command to set your mind on things that are above, not on things that are on the earth. The command to love your enemy is a command to find your hope and your satisfaction in God and his great reward—not in the way people treat you. The steadfast love of the Lord is better than life (Psalm 63:3). Loving your enemy doesn't earn you the reward of heaven. Treasuring the reward of heaven empowers you to love your enemy. Luke gives you the clue in Luke chapter 6. He translates ‘be merciful’ as your heavenly Father is merciful. You see here mercy is being contrasted to being mercenary. God, through the Lord Jesus Christ, is calling His people to love those who are both not in a position to reward us for our love, and even to love those who despite our love seek to abuse us. It is a love which loves not because of what it will get out of others, but it is a love implanted in our hearts by God Himself that enables us to love without anticipation or expectation of reward for that love, except from the heavenly Father. That is the love that the Lord Jesus is calling us to. And it’s the love of God, my friends. If anything in this passage teaches you that this way is not a way of works righteousness, it’s this passage, because this love is not a love that we can stoke up in ourselves. This is a love that only comes to us when God has taken up residence in our lives. Think of God’s words to Jonah. Jonah the prophet, a mighty man of God who had absolutely no compassion on the Ninevites. He wanted his people to have revival. He didn't want those Gentile Ninevites to have revival. God the Father says to him, in Jonah chapter 4 verses 10 and 11, words which spoke of His compassion not only on the people but even the animals. God the Father had compassion on those people who did not know their right hand from their left, and He wanted them to come and to enjoy the grace which is held in store for all those who embrace Him by faith. It’s easy to love those in whom we delight. It’s difficult to love those who are not only different from us but those who use us and abuse us and seek to take advantage of us. John Stott has said, and this hits me right between the eyes: "Everybody believes in love. But not love for those who’ve injured us." Everybody believes in love. But not love for those who’re outsiders. You see my friends, if you want to measure whether you’ve gone beyond niceness to real Christian love, look at your hearts and ask yourselves: "How do I love those who have hurt me? How do I love those who hate me? How do I love those who have no claim on my love?" Then, you will see how far you have to go in love. Thank God, the Lord Jesus does not leave us to our own devices, for this love cannot be created by human effort. We must run back to Him. We must get more love to Christ if we are to grow in this kind of love to one another. You see, there is no humanly generated love that can enable you to love people in this sort of a self-sacrificial way. Only a living and loving relationship with the heavenly Father, an assurance that He has given you everything that you need in Christ, an assurance that all blessing awaits in glory, can enable you to love those will take advantage of you. And that’s precisely what Christ is calling you to. And that’s precisely what Christ is calling me to. And if we would live this way for one day, there is no telling what would happen in our community. Amen. Oswald Chambers on Mt 5:48 - "Be ye therefore perfect, even as your Father in heaven is perfect." Our Lord's exhortation in these verses is to be generous in our behaviour to all men. In the spiritual life beware of walking according to natural affinities. Everyone has natural affinities; some people we like and others we do not like. We must never let those likes and dislikes rule in our Christian life. "If we walk in the light as God is in the light," God will give us communion with people for whom we have no natural affinity. The Example Our Lord gives us is not that of a good man, or even of a good Christian, but of God Himself. "Be ye therefore perfect even as your Father in heaven is perfect," show to the other man what God has shown to you; and God will give us ample opportunities in actual life to prove whether we are perfect as our Father in heaven is perfect. To be a disciple means that we deliberately identify ourselves with God's interests in other people. "That ye love one another; as I have loved you . . ."
The expression of Christian character is not good doing, but God-likeness. If the Spirit of God has transformed you within, you will exhibit Divine characteristics in your life, not good human characteristics. God's life in us expresses itself as God's life, not as human life trying to be godly. The secret of a Christian is that the supernatural is made natural in him by the grace of God (ED: AND THE SPIRIT OF GOD - cf Heb 10:29), and the experience of this works out in the practical details of life, not in times of communion with God. When we come in contact with things that create a buzz, we find to our amazement that we have power to keep wonderfully poised in the centre of it all. Chip Bell Who’s Your Daddy? This verse causes people a lot of headaches because taken just by itself, it sounds like Jesus is setting a standard we cannot possibly attain. But it’s worth noting that this verse is related to the verses we’ve just been reading. The word perfect here means complete or thorough. Jesus is talking about the way we ought to love. Loving only our friends and our family is an incomplete love that any human being can do. But loving your enemy—loving those that hate you and those that hate God—that kind of love is mature and fully developed. And that’s the kind of love that God has. So go the whole way in loving just as God does. Our love should be like God’s love. We should follow our Father’s example. Conclusion - You know, evangelicals never will be clearly understood by the world. Sometimes even our love is interpreted as hate. For example no matter how kindly you speak the biblical truth that those without Christ will perish, many will still consider that to be “hate” speech. But despite those misunderstandings, it is also worth considering whether there is any truth to the claim that evangelicals express “hate” to other people in the world. Is there anything to it? It is worth examining ourselves inside and out to make sure that we identify anything hateful in our actions or our attitudes: impatience, unkindness, envy, boasting, pride, rudeness, self-assertion, anger, resentment, and gloating. Are we protecting, trusting, hoping and persevering? We comfort ourselves with the adage, “Hate the sin, but love the sinner.” It allows us to justify some feeling of outrage against sin and unrighteousness. But when we express that outrage within earshot of the people we call “sinners”, I don’t believe that they can tell that we don’t hate them. And I’m pretty sure that we’re not acting the way love would act. I have a friend whose son, in a moment of uncontrolled rage, murdered his girlfriend. If that was your son—thrown in jail, awaiting trial and certain punishment—how would you feel? How would you treat him? I think it’s clear that we’re all against murder here. But how would you feel about your son? How would you treat him? Would you stick a big sign in front of his face that says, “All murderers will burn forever in the fiery lake of sulfur. Rev 21:8”? Or would you weep with him? Would you stand by him and comfort him, pleading with God to be merciful to him and not give him what he deserves? by hating those who oppose him. for even those who oppose him. You’re an evangelical. How do you treat the people in this world who hate God, who reject his truth and live by their own behavioral standards? God's people are called to be perfect: "Be perfect … as your heavenly Father is perfect" (Mt 5:48). In Scripture nothing is clearer than the unique holiness of God, so this cannot be a command for sinners to become God's ethical equals. It is rather the call to "be imitators of God…as dearly beloved children" (Eph 5:1-note). Children who treasure their parents typically mimic them. Christians should mimic their Lord, Who is perfect, thus reflecting His perfection in their lives. For some this will involve voluntary impoverishment for the sake of gaining true riches: "If you want to be perfect, go, sell your possessions and give to the poor, and you will have treasure in heaven. Then come, follow me" (Matt 19:21). For others it is not the pride of possessions but the pride of self-expression that must go: "If anyone is never at fault in what he says, he is a perfect man, able to keep his whole body in check" (James 3:2). While Paul calls on readers, not only to imitate God (Eph 5:1), but also to imitate him (1Cor 4:16; 11:1; 2Th 3:7), Paul denies that he is perfect (Php 3:12-note). Yet he calls believers to share in the derivative excellence that life in Christ bestows (Col 1:28-note; Col 3:14-note). Hebrews likewise speaks of the perfection of God's children, stressing that it is the result of Christ's death on their behalf: "by one sacrifice he has made perfect forever those who are being made holy" (Heb 10:14-note; cf. Heb 11:40-note; Heb 12:23-note). A key New Testament verse for understanding perfection in the Christian life is 2Corinthians 12:9 (note): "But he said to me, ‘My grace is sufficient for you, for my power is made perfect in weakness.'" Believers are perfect to the extent that they participate in the cruciform grace that God offers in Christ. Christ was perfected through the travail of righteous living amid the bruising realities of an unjust world. The means and abiding symbol of the perfection He won is the cross. His followers know perfection as they abide in the bright shadow of this same sign.